The other night I had a dream that it was the late 1990s, and the original Smashing Pumpkins were working on a prototype to the new Smashing Pumpkins' song "Starz." It sounded less like a Queen-like production, as it contained a bunch of guitar work from James Iha - wah-wah, Ebow, Digitech Whammy, etc. It was cool, and Jimmy Chamberlin's drum solo was still intact. Unfortunately, it was all a dream. Anyway, we can point the finger at Billy Corgan for any number of things. As much as he'd like to believe that Iha broke up the original band, Corgan could have fired whomever he wanted and continue the name Smashing Pumpkins. That's pretty much the de facto power that band leaders (who aren't necessarily the lead singer - Nikki Sixx, Noel Gallagher, etc. - but often are) have. So we can safely say that Corgan broke up the old Smashing Pumpkins. We can also say that, when rebuilding the band, Corgan chose to continue the bandmate relationship with the only peer he truly needs: drummer Jimmy Chamberlin. We can also say that Corgan, after the original Pumpkins and Zwan, was firmly unwilling to relent some creative input to his peers (except for Chamberlin, of course), so the rest of the band needed to come from outside his peer group. They needed to be obedient Christians (also see Zwan), or at the very least, not the following people: James Iha, D'arcy Wretzky, Melissa Auf der Maur, Eric Erlandson, Jimmy Flemion, Dennis Flemion, Mike Garson, Eric Avery, Dave Navarro, Kim Thayil, Ben Shepherd, Matt Sweeney, David Pajo, Paz Lenchantin, Dean DeLeo, Robert DeLeo, Pat Smear, Krist Novoselic, Jerry Cantrell, Mike Inez, Mike Starr, etc. (In other words, musicians from the Smashing Pumpkins, Hole, The Frogs, Jane's Addiction, Soundgarden, Zwan, Stone Temple Pilots, Nirvana, Alice in Chains, etc.) We can safely say that the bandmates that Chamberlin auditioned fit that sort of Corgan-obedient, less-than-equal archetype. 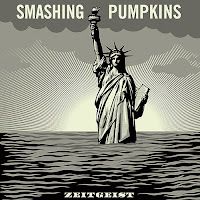 Anyway, forgive the rambling, as my point is this: On Tuesday, October 30, 2007, after a summer of lackluster sales for Zeitgeist, Warner is reissuing the album with two of the three separated bonus tracks, and exclusive bonus track, and a making-of DVD - solely through the electronics retailer Best Buy. Enough is enough. They should have released grey Zeitgeist on July 10, 2007, and that should have been the only version of the album. The end. If record companies, and other dinosaurs of commerce, can only figure out that adapting their business model to this changing media frontier would only give them greater profits and longer viability, instead of passing the headache of the same ol', same ol' to the consumer. Talk about "Bleeding the Orchid." And by the orchid, I mean the fans - out of about $10 or more at a time.